Note: Our apologies - the links in the earlier INSIGHTS email did not work. Please discard the previous version. Once of the most useful tabs in Student Planning is the “Notes” section. It provides a place for you to make notes that will help you and your Advisee keep track of important issues and information you have discussed. In addition, the Notes tab will be used when you are advising a student who has a double major, and thus two advisers, and also used by the Class Deans to approve the requests of students wishing to take more than 18 credits. Don't use the Notes section for private or confidential communications. People who can see these notes includes the student, any current and future advisers, deans, and the registrar. Do remind your Advisees that they may also enter notes in the same place as a means of archiving discussions they've had with you. Don't use the Notes section for time-sensitive information. No notice is sent to the student when you add in a note, but it is a good place to store information that will help you and the student in future discussions. Don't forget to click "Save Note" once you’ve typed in your message. Do use the Notes function to signal your approval of an Advisee's schedule if you are the first of the two Advisers to approve a student's schedule who has a double major. The second Adviser the Advisee meets with will then review the student's schedule for the second major requirements, add a note of approval, and then click the "Review Complete" button. Here's more information on that process: Advising Process for Students with Two Majors. Do remember to check FERPA laws regarding the privacy of student educational records when using the Notes section. If you have questions, visit Family Educational Rights and Privacy Act (FERPA). Do notice that the last note sent is listed at the top of the note history and that each saved note will appear with date, time, and attribution. Do remember if you need to register a concern about a student, you should contact the Dean of Studies' office under separate cover (either email, phone, or through the Early Academic Reports, which will be coming soon). 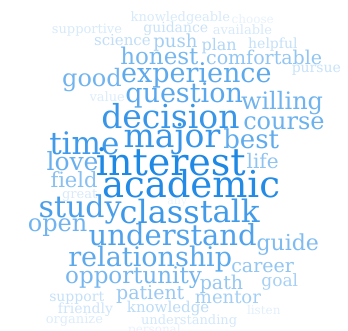 What are students looking for in an adviser? One of the questions we asked our first-years in the survey we sent over the summer was what qualities are most important to them in working with an adviser. Here's a word cloud of their responses.